After overwhelming approval by the Pirate parent and educator community and the Lubbock-Cooper ISD Board of Trustees, LCISD will implement a nine-week grading period system (transitioning from a six-week grading period system) effective at the start of the 2018-19 school year. As with any transition, we anticipate a "learning period" during which parents and students will have questions. When the district surveyed parents regarding a nine-week grading period system, respondents were able to submit questions about the system. We have compiled the most frequently asked questions (and their answers) below. What was the response from parents and teachers when the idea of a nine-week grading period system was introduced? Parents and teachers were surveyed at the beginning of the 2018 spring semester. Parents and teachers voted in favor of a change to a nine-week grading period system. Why a nine-week grading period system? A nine-week grading period system allows teachers more time to assess a student’s grasp of concepts, giving them time to reteach concepts and/or reassess if necessary. A nine-week grading period also more evenly distributes days of instruction in each semester, whereas the current six-week grading period system includes more days of instruction in the spring semester than in the fall semester. How will this affect my child’s UIL eligibility? Schools using a nine-week grading period system must check grades at the end of the first six weeks of the school year and students can lose or regain eligibility. 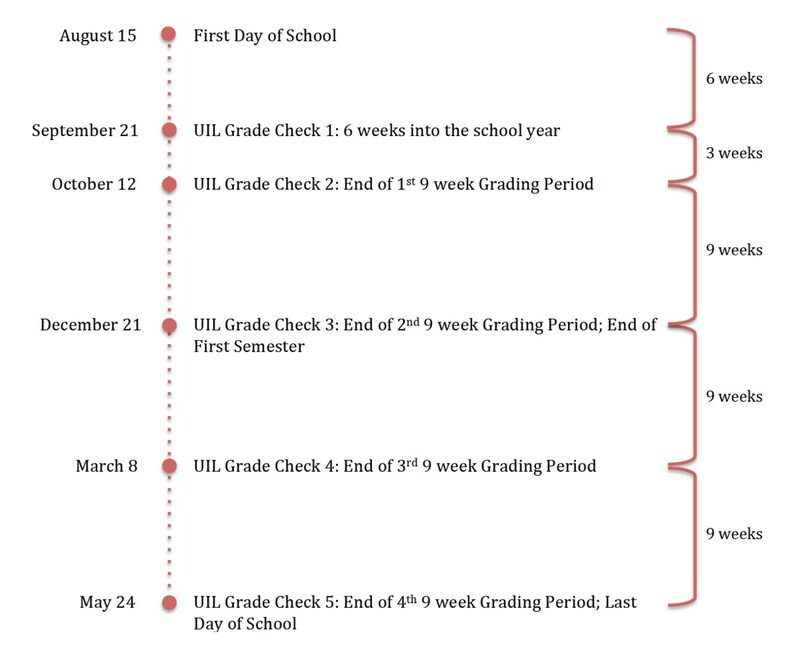 The next grade check for a nine-week grading period will occur at the end of the nine-week grading period (even if it is more or less than three weeks). Each subsequent grade check will occur every nine weeks until the end of the year. Retrieved from https://www.uiltexas.org/files/policy/TEA_UIL_Side_by_Side.pdf; April 4, 2018. The above graphic does not include three-week progress reports and seven-day grace periods. See the LCISD "Nine Week Eligibility Calendar 2018-19" linked below for more information. Will I still receive a progress report every three weeks? Yes. Parents will still receive a progress report every three weeks. As always, parents are also able to view their child’s up-to-date grades online at any time via Skyward Family Access. How will this impact the district calendar? The implementation of a nine-week grading period system will have no impact on the district calendar. All holidays, breaks, etc. remain the same. How will this impact hours in the school day? The implementation of a nine-week grading period system will have no impact on hours in the school day or class period times. The nine-week grading period system will go into effect at the start of the 2018-19 school year. How will this impact state-mandated curriculum? All required Texas Essential Knowledge and Skills (TEKS) will be covered in a nine-week grading period system just as they have been in a six-week grading period system. Teacher lesson plans may be adjusted in coordination with the new nine-week grading period system, but the concepts taught and the amount of material covered will not change. How will this affect STAAR/EOC testing? The implementation of a nine-week grading period system will have no effect on the dates of STAAR or EOC testing, which are pre-determined by the Texas Education Agency (TEA). Are other school districts utilizing a nine-week grading period system? Several Texas schools have transitioned to a nine-week grading period system, including Round Rock ISD, Clear Creek ISD, San Angelo ISD, Killeen ISD, Texas City ISD, Humble ISD, Fort Bend ISD, Denton ISD, Socorro ISD, Bullard ISD, Lampasas ISD, Conroe ISD, McKinney ISD, Prosper ISD, Lake Travis ISD, Pearland ISD, Lewisville ISD, Schulenburg ISD, Grand Prairie ISD, Duncanville ISD, Spring ISD, and others. Will this affect my child’s credits/graduation requirements? No. The implementation of a nine-week grading period system will not affect a student’s credits or graduation requirements. A student’s transcript will reflect the same number of credits regardless of the amount of weeks per grading period. Who can I contact if I have additional questions about the nine-week grading period system? Please contact your child's campus principal if you have additional questions about the nine-week grading period system.